I just want to know why they put garbage cans on the shoulders of all these mechs. If you chop those off, cut off the missle port cover and remove the jump jets then the Centurion doesn't look too different from the current IWN mini. 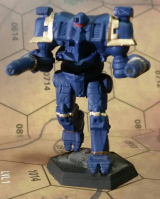 I think I got one DA Centurion that I repainted and maybe a few more though the game never did anything for me. One of the things that put me off were the little things like the radiators/garbage cans all ove them. Ordered the bits needed to make an attempt on the DA Yen Lo Wang, a Centurion and a Hatchetman arm, plus some clay for minor league modeling after the fact, using plasticard and if you can believe it it, stickers to do the shield now. Might as well get that out of the way.